NOVEMBER DISNEY EXTRAVAGANZA #10: Honey, I Shrunk the Kids (1989) – dir. Joe Johnston | Films Like Dreams, Etc. Honey, I Shrunk the Kids seems to fall within the pile of those family-targeted films that everyone has seen, yet doesn’t seem to stand out as something particularly distinct or special to its viewers. Frankly, I do remember watching this movie as a youngster, yet remember little to nothing about it. If anything, it stands as being one of the standout features starring Rick Moranis, who had just a dash of fame as a comedic actor in the 80s and 90s. In fact, it was a rewatch of Ghostbusters earlier this month that reminded me of his existence and, thus, this film. As a final verdict, I’d have to say that it stands amongst the many other Disney movies that probably leave a much better lasting impression when watched as a child. 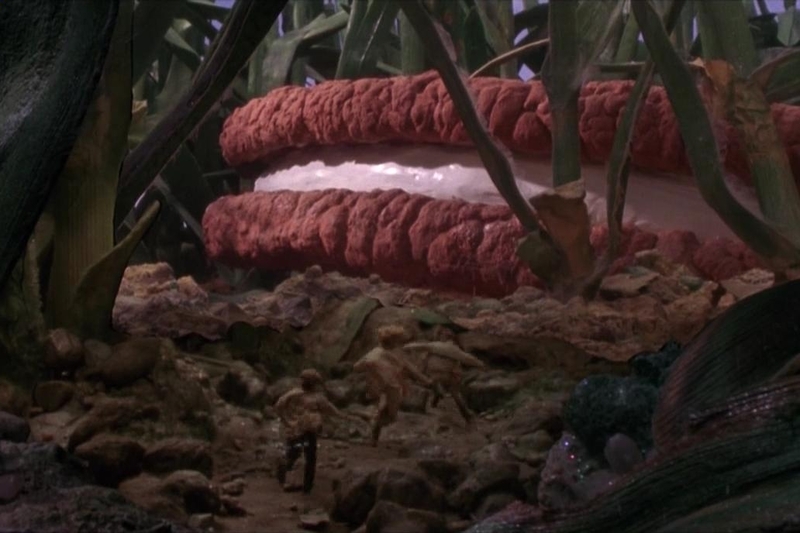 My theory is that Honey, I Shrunk the Kids is Disney’s attempt to connect its younger audiences with the special-effects-laden sci-fi flicks of the yesteryear. Even its title tells audiences everything they need to know about the film, harking back to such movie titles as The Day The Earth Stood Still, It Came From Beneath the Sea, and The Incredible Shrinking Man. Indeed, the scientific fascination with shrinking objects (and people) plays front-and-center here. This makes the story itself fascinating in its special spin on the typical family-centered comedy film – particularly in its absurd brand of comedy, since its the children themselves who, when out of eyeshot, find themselves unwilling experiments of a shrinking machine. 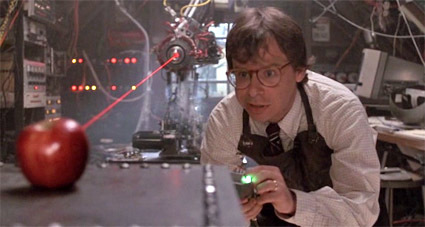 Moranis nails his role as exactly kind of nerdy, neurotic scientist father who is also rather sympathetic in how his good intentions are unfortunately slandered by his inconvenient clumsiness. Like many of these kinds of movies, the young child actors that play the shrunken children don’t demonstrate any particular range of talent that make them anything more than young people playing their parts. This, of course, is hardly a flaw, since they perform exactly how their roles call for and such a film really doesn’t need much else. Perhaps this is my adult cynicism speaking, but besides a few scenes featuring Moranis, I didn’t particularly find much about this film very funny. It’s clear that the humorous aspects are written with its young Disney-viewing audiences in mind and it certainly shows. However, what Honey, I Shrunk the Kids does do very creatively – and perhaps the single aspect it’s most known for – is found in its representation of the living world through the eyes of our inch-tall protagonists. Blades of grass suddenly seem to be stories high, and the slightest sweep of a broom or drop of rain could bring about the utmost calamity. While the plot itself seems to reach a standstill once the kids are newly shrunken and left to find for themselves, these parts are certainly some of the most visually creative of any movie of its kind. There’s even an interesting subplot thrown in involving a giant ant they befriend – one that, in fact, is animated in ways that hark back to old-school methods of practical stop-motion. Honey, I Shrunk the Kids is an extremely predictable and offers very little for itself to transcend past the many other disposable live-action Disney fare. With that being said, it distinguishes itself from such a fate with its charming – even spellbinding sets and practical effects that have helped it to reside favorably in the hearts of many who grew up with it. I only wish that I had watched it far more often in my childhood so I could fully appreciate the fruits of its product in the way that it was intended. That time machine invention could sure be useful right about now. This entry was posted in November Disney Extravaganza, Reviews and tagged 1980's, Disney, Honey I Shrunk The Kids, Joe Johnston, November Disney Extravaganza. Bookmark the permalink.